d2g is using Smore newsletters to spread the word online. 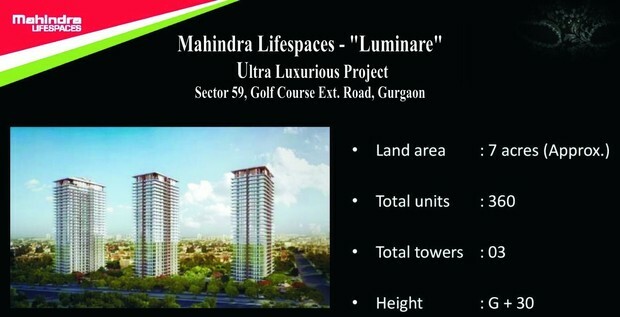 "Mahindra Lifespaces Luminare"... Luxury Private Residences..
Mahindra Lifespaces presents ultra luxurious project "Luminare" on Golf Course Extension Road, Sector 59 Gurgaon. Located at Sector 59, Gurgaon. Well Connected to Golf Course Extension Road. 3 BHK + servant quarter – 2985 sqft. 4 BHK Penthouse – 4887 sqft. 5 BHK Penthouse – 6085 sqft. Cheque in favor of "Mahindra Homes Private Limited"
Should you be interested or would like to confirm your Booking, please feel free to Contact us on +91 8826997782, 9911087751. Sana Associates is authorized sales organizer for Mahindra Lifespaces.